Despite the recent upheaval in Goa between taxi drivers and tour operators working with Russian speaking tourists, industry experts believe no protest can harm the excitement of Russians when it comes to the Indian state. With most Russian tourists abandoning Goa’s beaches as the tourist season is about to end, the state’s tourism authorities are also heading north to take part in MITT 2014 travel exhibition that kicks off today in Moscow. Presenting Goa at one of Russia’s largest tourism events, Goa Tourism Development Corporation (GTDC) aims to promote the state as a hospitable and progressive destination for Russians. GTDC estimates that international tourist arrivals rose by 9.27 per cent in 2013. Russian tourists scored the highest this season. According to GTDC, the state recorded more than 162,000 tourist arrivals from Russia within just three months of the current season (November to January) while during the six months of previous season, 140,000 arrivals were registered. The Russian Information Centre in Goa estimates the tourist inflow from Russia and other CIS countries increased about 9 percent this season compared to the previous season and 35 percent when looking at to 2010 figures. This winter season, most of the destinations preferred by Russian tourists were up in some kind of revolt. Turkey, Egypt and Thailand experienced political upheaval forcing Russia’s tourism body Rostourism to call upon tourists to abstain from visiting troubled areas in the affected countries. Generally peaceful Goa has also seen number of protests, thankfully not armed ones. Local cabbies demanding that the government take measures to protect their sources of income, however, caused enough violence in the state, leaving the tourism industry nearly paralyzed for several days and putting dozens of tourists in danger of missing flights, cancelling tours and not being able to reach the hospital at the time of emergency. With India going for general elections in just a few weeks, such protests may be simply understood as pre-election excitement and are likely to cool down once the election wave is over. On the other hand, the protests raised some of the old problems that may finally be solved before the new tourist season kicks off in November. Out of eleven issues put forward by the taxi operators before Goa Chief Minister (CM) Manohar Parrikar a month ago around six were accepted resulting in the forming of special police squads to pick up foreigners doing business illegally. There was also a green light for the banning of radio and fleet taxi services from outside the state that were going to operate with electronic metres. At the same time, local cabbies were told to operate on point-to-point or kilometre basis, a measure long-awaited by the whole industry, except, probably, taxi drivers themselves. However, at present tourists still have to negotiate the cost of each trip. Some of the measures approved by the Goa CM ran counter to the industry vision and logic – for example the suggestions that tour operators should not conduct any guided tours. In a reply to the government’s decision, influential industry body Travel & Tourism Association of Goa (TTAG) addressed the CM with a three-page note, a copy of which is with RIR. “We have suggested that taxis should be radio controlled, metered and have CCTV for the safety of the tourist,” Francisco de Braganca, President of TTAG, said. He added that the industry does not expect the government to implement the proposed measures overnight, especially before the elections are over. With the announced ‘Model Code of Conduct’ for the coming elections, the government cannot take any decision that can be perceived by the Election Commission as an attempt to favour a particular section of society in order to gain their votes. “I do not see this issue repeating in the next season as the projection is that the next government at the centre is the same as in the state. I hope and expect the government to solve this issue once and for all before the next season,” de Braganca said. Tourism professionals back in Russia seem more concerned about the Thailand developments, the mystery over Malaysia’s lost plane and, of course, the Crimea saga as all of them may affect the tourism market in nearest future. Officials from Russia’s Federal Tourism Agency (Rostourism) told RIR that no one in Rostourism is familiar with the situation in Goa and no one heard of any uneasiness. “We’ve got lots of other issues here now,” he added. “The safety of tourists is definitely a first priority for a tour operator, but so far according to information from our Indian partner, our company and tourists did not face such issues in Goa,” Ivor Vucelic, Marketing and sales director at TUI Russia & CIS said. A Coral Travel executive said that tourism is one of the largest income sources for Goa and the state government cannot let it drop, therefore any violence should be minimized by all possible means. “I would not say that the situation in Goa was really as unstable as it was described by media. Yes, taxi drivers went on strike several times, but they were pre-planned and approved by the government. The only thing we can recommend our tourists is to by-pass any such meetings and protests in towns and villages as in the premises of hotels and resorts it is absolutely calm and safe,” Marina Makarkova, marketing head of Coral Travel told RIR. Konstantin Gorin, Tourism Director at Labirint travel company, believes the incidents in Goa are nothing more than clash of interests of local business groups. “Same problems were there in Greece, Turkey and other destinations long time ago. There is only one possible vector of development. Tour operators will always win as it is the tour operator who is bringing tourists to the particular destination,” he says. Though some industry players and even Russian diplomats warned against possible decrease of Russian tourist’s inflow in Goa next year, tour operators believe it hardly can happen. “So far we have not seen any effect. But perhaps it will affect the foreign tourist in the next year. Besides this year there are worse issues in Syria and Thailand. The taxi issue in Goa in that context is treated as a minor issue. However let us keep our fingers crossed,” de Braganca added. Marina Makarkova believes Thailand and India will remain the main destinations for Russian tourists during the winter season. “India has its own advantage of being the closest country in South-East Asia with only a seven-hour flight, the country with a diverse cultural heritage and long-term friendly ties with Russia, as well as low-cost tour packages,” she said. 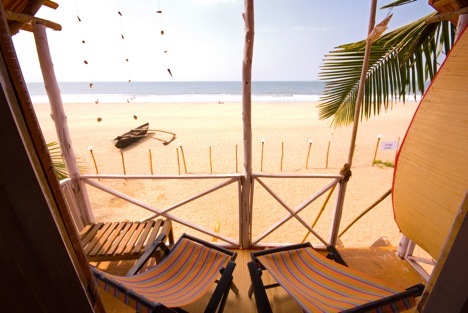 Vucelic from TUI agrees that Goa attracts tourists with its cheap accommodation. “The room costs are less than in Thailand or the Emirates even in case of five-star properties,” he said. Konstantin Gorin noted that Goa grew about 20 percent this season and the geography of tourists from Russia is widening. “People from Central Russia and Siberia still prefer Thailand, but for tourists from the European part of Russia, Thailand is quite far and thus more expensive then Goa,” he said. Gorin believes that the most important advantage of Thailand over Goa is visa-free entry for Russians. Although India, too, has recently included Russia in the list of countries to get visa on arrival, the mechanism is yet to be implemented and tested. He says if it will work as smoothly as it was described and tourists will be able to apply for visa online three days before the flight, it will become a great advantage for Goa.